Stephen Bunting is returning to his boyhood club Woodvale after five seasons with Instonians. 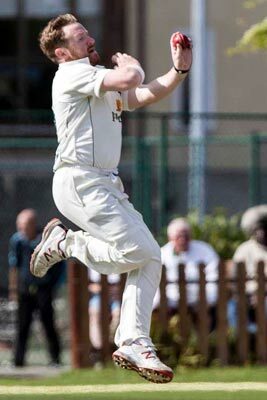 The left-arm seamer left Ballygomartin Road in November 2013, and was a part of the Instonians side that won the title in 2016. “I promised Woodvale when I left that I would end my playing days with them.," Bunting told CricketEurope. “With a change in work circumstances I won’t be able to commit to the practice sessions required any longer and there are now a number of youth players ready to break through and I would perhaps only be holding them back." He has taken 97 wickets in top flight cricket at just over 28, with his best-haul being 4 for 4 in the Irish Cup against Eglinton. He will be best remembered at Instonians though for his hat-trick against CIYMS in that successful title winning campaign. “I have made lifelong friends at Instonians and enjoyed my six years with the club. I want to thank Erica Luke, Norman Shannon, Andrew White and Andy Rose for making me feel so welcome and for all they have done for me. " Bunting played seven matches for the Northern Knights in the interpro series but injuries in recent seasons have restricted his appearances at all levels. He's clearly relishing the opportunity to return to Woodvale for the 2019 season. “Woodvale have been enjoying a resurgence and have been challenging for promotion in the past few seasons. "There are lots of things happening both on and off the field and with the return of Wayne Horwood and a few other signings in the pipeline I’m looking forward to the coming season at Ballygomartin Road."